Height 5 feet 4½ inches. Weight 140 lbs. Chest measurement 33½-37 inches. Complexion light. Eyes blue. Hair light brown. Sight - both eyes 6/6. Hearing and colour vision both good. Limbs and chest well formed. Full and perfect movement of all joints. Heart and lungs normal. Teeth only fair. Free from hernia, varicocele, varicose veins, haemorrhoids, inveterate or contagious skin disease. Vaccination mark. Good bodily and mental health. No slight defects. Good physical development. Mole size of a threepenny bit on right flank. 27 June 1915 - admitted to HM Hospitsal Ship Sicilia with shell wounds to the shoulder, buttock, head and arm. Died on board. John Robert Campbell was the eldest son of a well known family from Waituna, Waimate, South Canterbury. Sometimes known as Robert and also as Jack, he was born on 2 September 1891 at Waimate to Scottish born Robert Campbell and his German born wife Helena née Westphall, who was some twenty years younger than Robert. John’s schooling was at the local Waituna School, where his father was a member of the school committee. In December 1901 John and his brother James both got a mention at the Waituna School annual picnic and prize-giving, John being placed third in Standard III. After games, refreshments, the hosting of the recently acquired flag and the singing of a verse of the National Anthem, the prizes were awarded by the Rev. G. Barclay. Not long before the declaration of war Jack Campbell attended a euchre party and dance in aid of the Waituna School prize fund, where he a consolation euchre prize. When John enlisted at Timaru in August 1914, he was farming for Mr Studholme at “Te Waimate”. He nominated his father as next-of-kin, was passed as fit, though of small build, and gave Presbyterian as his religion. One of the earliest men to offer his services in the war effort, John Robert Campbell departed with the South Canterbury Mounted Men by the slow train from Timaru on 17 August 1914, amidst much excitement in the town, whilst their horses were trucked at the Smithfield siding at Waimataitai. He had already given 18 months with the Studholme Mounted Rifles. The Mayor spoke of the pride in them and said that they were going forward with stout hearts and strong arms. "Be true lads to your King and Empire, to yourselves and your country, and put your trust in God," he said. Little did they know what lay ahead. Adept with horses, John handled nearly every horse put aboard the steamer at Lyttelton, when his regiment was embarking. Although he saw only eight months of service, John Robert Campbell had opportunity to experience the inside of the barracks for committing some minor offences and incurring punishments on his Conduct Sheet – 3 February 1915, smoking on tables, 2 days confined to barracks; 18 March 1915, firing a round of ammunition during loading practice, 3 days confined to barracks; 19 March 1915, absent from Squadron limit whilst a defaulter, 4 days confined to barracks. John Robert Campbell, 7/27 was admitted to the Hospital Ship “Sicilia” on 27 June 1915, with shell wounds to the shoulder, buttock, head and arm. He died there on 30 June 1915, succumbing to the wounds inflicted at the Dardanelles. John had been an orderly to Major Wain and he probably suffered his injuries on the same occasion as the Major did. Q.M.S. R. Manchester writing from a military hospital in Egypt to his mother at Waimate in July 1915, notes that Jack Campbell had been wounded by a shell and died on the boat. “They had to amputate his leg right at the trunk, and he didn’t get over it.” Lieutenant G. C. Dailey, in a letter written on 29 June 1915 to Mrs Tavendale, refers to the wounding of Jack Campbell in the shelling which killed William Tavendale. 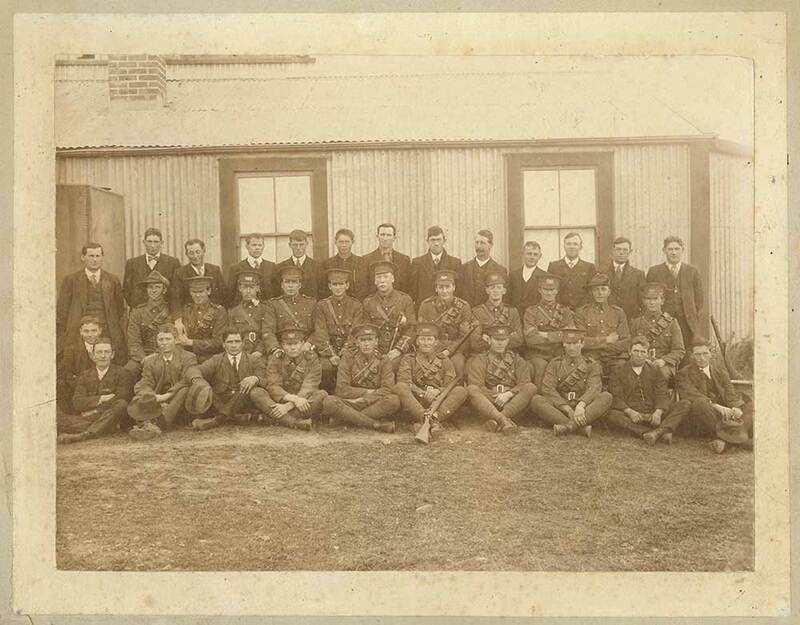 The St Augustine’s Young Men’s Society, Waimate, held a mock banquet on 13 July 1915, at which a toast was proposed to “Our Boys at the Front”. By this time several of them had been wounded and one had given his life. Mr W. M. Hamilton who responded to the toast, had just received a letter from his son stating that Jack Campbell, in going out with provisions, had “bagged a sniper” on his way back. Those present at the banquet were unaware that Jack had in fact died. On 1 August 1915 a memorial service was held at Knox Church, Waimate, for Trooper Campbell and two other local servicemen who had laid down their lives for their country at the Dardanelles. The choir sang a special anthem. As John died intestate, his estate was administered by the Public Trustee, there being only £13.9.7 in Stock-in-trade to account for. His medals - 1914-15 Star, British War Medal and Victory Medal, plaque and scroll were all sent to his father in 1921. Trooper John Robert Campbell is commemorated on the Lone Pine Memorial at Anzac, Turkey, and his name is inscribed on the Timaru Memorial Wall and the Waimate and Waituna War Memorials. His brother James Campbell died of wounds in France in 1917. Both Jack and his brother Jim are remembered on their parents’ headstone in the Waimate Cemetery, their father dying in 1924 and their mother in 1946.. And in 1916, 1917, 1918, 1919, 1920 and 1921, an In Memoriam notice – For the Empire’s Cause, “He did his duty.” – was inserted variously in the Waimate Daily Advertiser, Otago Witness, Otago Daily Times by his parents, brothers and sisters. 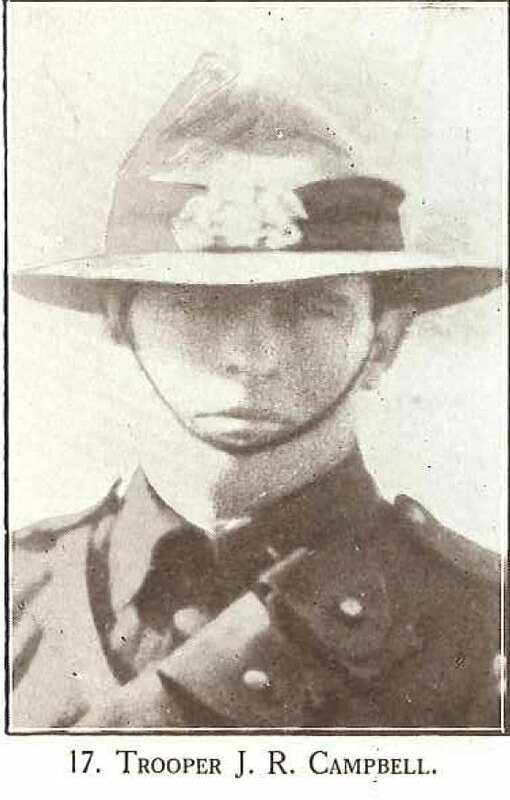 The name of Trooper J. R. Campbell also appeared under “Paid the Supreme Sacrifice” in the Roll of Honour published regularly in the Waimate Daily Advertsier.